What is a tax free investment account? A Tax Free Savings Account (TFSA) can help you save more for the long term because you don't pay tax on the growth of your investment. It is an investment account that the South African Government has introduced to encourage everyone to save more for the long term. The longer you remain invested, the greater your gains. We have weighed up all the available products and chosen to partner with Investec for this investment product. We believe they provide one of the best Tax Free Savings products. What does "Tax Free" mean? You pay tax on the interest you earn on your savings account at the bank. You pay tax on the interest, dividends and capital gains you earn on a unit trust investment. You pay capital gains tax when you sell an asset, for example your house. Because you don't pay tax on your original investment or on your tax-free returns in a Tax Free Savings Account, you can maximise the power of compounding - which is the growth on your growth. Investors can invest either monthly and/or in a lump sum. The maximum amount you can invest in any tax year is currently R33,000. If paying by debit order, you can invest a minimum of R500 per month and a maximum of R2,750 per month. You have the flexibility to stop your monthly contributions at any time if you cannot afford the monthly debit order. Lump sum payments must be a minimum of R 10,000 and a maximum of R33,000. 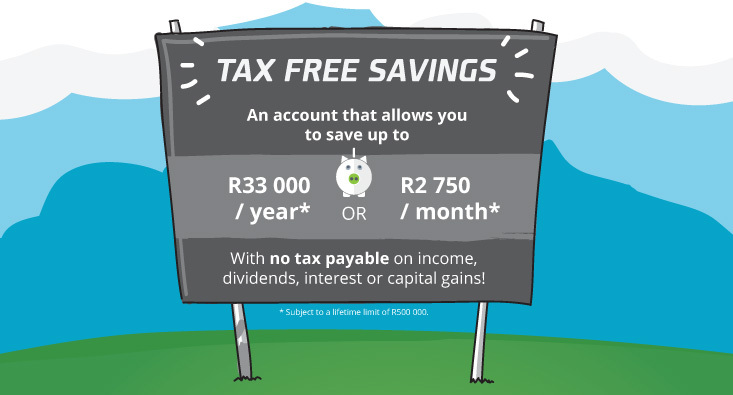 The current market value of your Tax Free Savings Account is payable in part or as a whole at any time without any penalties. However, don't fall into the trap of being tempted to use your Tax Free Savings Account like you might a traditional bank savings account and withdraw from it regularly. Once you have withdrawn money from the investment, you can never add that money back in to reach the maximum lifetime contribution limit of R500 000. Annual Fees are payable and these include an Investment Management Fee (which is charged by the investment funds in which you invest and varies from fund to fund), an Administration Fee (which is charged by Investec for managing your money), and finally a Beanstalk Fee (which is a low 0.50% + VAT (if applicable) per annum and includes fund screening, analysis and recommendations; back office support; as well as access to a CFP Qualified Financial Planner; ongoing advice, support, newsletters and fund and industry information). All fees are deducted by means of a unit reduction by Investec and paid across to the applicable service provider.